Lion Glen Steakley gives Ann McBride a 7 gallon pin. The American Red Cross Donor Appreciation Blood Drive May 19 was very rewarding for the 112 who came out to give. 87 were able to donate, of which eight gave double red cells, making a total of 95 units given on the goal of 97. 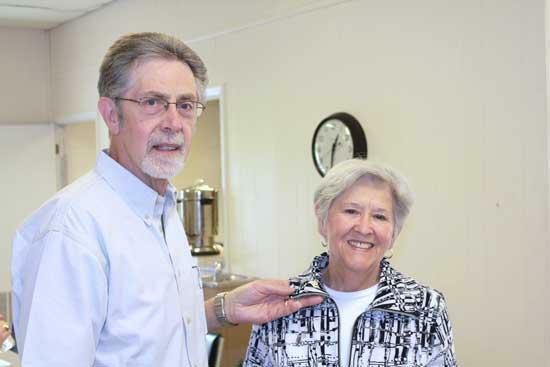 Each donor and volunteer received several door prizes from the local businesses in town. Howard Witty donated his 168 pint, receiving a 21 gallon pin. His blood could have possibly went to 504 different people helping to save their lives. Howard is a true hero who gives of himself so that others may have a chance to see more tomorrows. Ann McBride received a 7 gallon pin, Cheryl K. Franklin received a 6 gallon pin, Stephen Moss a 3 gallon, Kayla Hindman and Sandra Satchell both received 2 gallon pins, and Weldon Parkinson received a 1 gallon pin. Coming out to donate for the first time: Alicia A. Bailey, Kelcey M. Evans, Tammy Mears, Dustin W. Taylor, Deana J. Pillow, Von Carl Franklin, and Barbara Strickland. At the end of the blood drive, tickets corresponding to the number given when signing in, were mixed together and number 102 was drawn. Randy L. Slone became the winner of a $100 Visa Gift Card. Congratulations Randy. The Woodbury Lions Club and the American Red Cross wishes to express a hardy "thank you" to all the local heroes who gave of themselves for others, and would like to recognize local businesses who helped make the drive a big success. 200 Main Family Salon, Antiques On The Square, Arts Center of Cannon County, Auto Zone, Bird Song Adhesives, Boyd's Garage, Briar Rose Flowers, Bromley & Jennings Auto Service, Cannon Courier, Cannon Market, Chilangos Mexican Restaurant, Coco Tan & Spa, Curves for Women, D J's Pizza & Steakhouse, Dollar General Market, Hayes Bros Auto Care, Hibdon's Body & Auto Service, Higgins Car Wash, Roger Hindman's Body Shop, Hometown Flowers & Gifts, Jennings Jewelers, Jenny Rose Antiques, Jim's Liquidation Outlet, Joe's Place, Legendary Cuts, Masiongales, The Millennium Hair Salon, Moonlite Drive-In, The Old Feed Store and Antiques Mall, Off The Hanger, O'Reilly Auto Parts, Osborne's Bi-Rite, Parsley's Market & Deli, Piggly Wiggly, Potters Ace Hardware, Quick Shop Market, Regions Bank, Rite Aid, Roto-Rooter, The Scoreboard, The Shirt Shack, The Steaming Cup, Stone Gait Tack and Feed, Subway, Suprema Pizza, Tangles Hair salon, Vance Brothers Motor, West End Tobacco, Woodbury Auto Express, Woodbury Farmers Co-op, and Woodson's Pharmacy. A very special Thank You to Benefit Alternative, Care All, DTC, Express Cash, FirstBank, Hardies, McDonalds, MTEMC, Middle TN Natural Gas, Potter's Ace Hardware, Tom Brady of the Readyville Mill, Smith Funeral Home, Sonic, and Stones River Hospital with providing items for everyone.